To benefit from this special limited offer to receive the FAX server for free, you only need to purchase Voipswitch Class 5 Switch, multitenant PBX Portal and one of our Mobile Softphones (Android, iOs, BB, Symbian, Windows Mobile). Start offering your clients what they cannot get from anyone else! 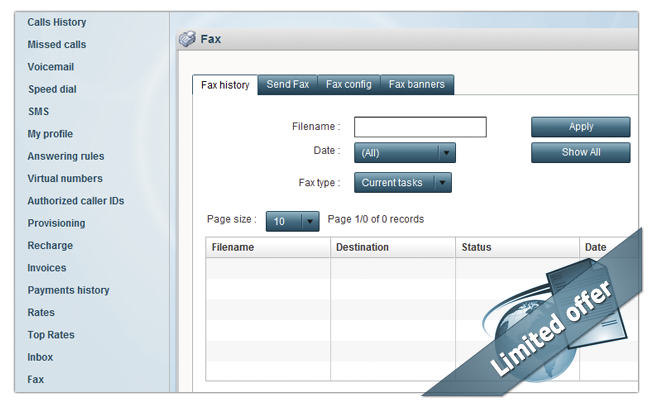 The new module of FAX smoothly collaborate with PBX platform which supports a multitenant hosted model allowing to offer fully equipped, dedicated PBX services for business customers with unlimited number of PBX master accounts and boundless employee accounts in multiple extensions. Additionally you can offer high quality voice and video calling through our Vippie! Video applications.